Happy Easter from all at Holiday Cottages! The Easter holidays are nearly upon us! So, if you still haven’t planned your activities, here are a select few of the things going on in Cornwall with suggestions of where to stay nearby. Inspired by the new Smuggling exhibitions, enter the smugglers’ den to make your own flintlock pistol, pop-up smuggler and secret chest with a concealed compartment. Plus, search for the concealed contraband hidden around the Museum with the Free Traders’ Trail. Plus, on Easter weekend, make your own bunny and chick masks and pour your own mini chocolate Easter egg. Stay at this spacious first floor apartment situated in a prestigious waterside development on Falmouth Harbour (sleeps 6). Take a tour of the monkey enclosures and learn about these fascinating creatures at the Monkey Sanctuary. You can also take a gentle stroll around the woodland gardens, and let the children swing like the monkeys in the play area. Have lunch at the award-winning Treetop café and when the day is done, go back to this lovely 4 bedroom house (sleeps 8) with views over Looe Bay and out to sea. Chocolate Unwrapped is the Eden Project’s festival telling the story of chocolate, how it was found and how it became so popular in Europe. Visitors will be taken on an interactive journey through the Rainforest Biome to see real cocoa trees and meet characters along the way. Children can also make their own chocolatey creations, and adults will be able to take special chocolatier workshops. Eat your chocolate delights back at this newly refurbished 3 bedroom house (sleeps 6) with stunning views over St Austell Bay. The Park is unveiling a £300,000 investment in attractions for the 2014 season. One of its most exciting projects is a new area for toddlers and pre-school children open in time for the Easter holidays. Swampy and Dina Land is a 2,000 sq m enclosed area with rides and play areas for children under the age of five. Stay at this 2 bedroom apartment (sleeps 4) with a sun trap patio situated in the idyllic hamlet of Little Petherick. Close to the famous Camel Trail and the fishing village of Padstow. With a programme of family activities including duck races, egg hunts and animal workshops, there’s lots to do at the Newquay Zoo. On 14th April Michaela Strachan will be there with her Wild Adventures Show, which visitors can go to at no extra charge. On the Easter weekend there is an egg trail in the Dragon Maze, and don’t forget to join the Easter Bunny tea party at 1pm on Sunday 20th April. Close to Fistral beach and Newquay town centre, stay at this 2 bedroom mews house (sleeps 4). Perfect for beach holidays and a spot of golfing. Get hands-on with history this Easter weekend. Young adventurers will be needed to crack clues and explore hidden corners of Tintagel Castle on this exciting quest. Those who succeed will receive a delicious chocolate reward. Take your prize home to this smart detached cottage (sleeps 6) a mile west of Tintagel. I visited Tatton Park this Easter weekend for a spot of photography in its gorgeous selection of gardens. Little did I know that I’d also find myself caught up in the hustle and bustle of the many family activities taking place across the park! Beatrix Potter inspired the weekend’s events; these included a Peter Rabbit trail across the gardens, the Pigling Bland trail and the Easter storyteller in the farm, and also magic shows and Punch and Judy shows in the stable yard. An adventure playground, an old-fashioned style merry-go-round, and storytelling time in the barn rooms also added to a long list of things for families to do. I bumped into Peter Rabbit several times as he tried to hide from Mr McGregor, and found myself unwittingly following the Peter Rabbit trail across the gardens, meeting many of Potter’s most cherished characters along the way. It seemed an especially good day out for parents looking for some entertainment for their children. It was also a lovely place to take photos, particularly the Japanese garden which could only be observed from its periphery so as to keep the careful planting in tact. It was so picturesque, it looked like something from a picture book. The grounds just outside of the main area were ideal for a more peaceful walk away from the popular activity areas. They were also great for a bit of wildlife photography, I saw some young deer settled down near the lake and there was also a special hut for bird watchers. Luckily, the activities don’t stop at this bank holiday weekend. Many of them continue on throughout the school holidays and beyond, so you have plenty of time to visit yet. For instance, from now until the 12th April it is lambing fortnight at the farm, the ‘Beatrix Potter’s Life’ exhibition in the Mansion runs until 1st September, plus many more events and activities. If you like the sound of Tatton Park and are also looking for a break away in Cheshire one weekend, you won’t go far wrong with Broomfield Barns (sleeps 5), nestled in the Cheshire countryside and near some award-winning local pubs. For this holiday cottage, and many more, visit our main site for details. Easter is nearly upon us! As the flowers start to bloom and the sun begins to shine for that little bit longer each day, it is time to start planning those Easter holiday activities! 1. Tarmar Valley Spring Trail Festival – With over 30 guided walks and activities to suit all ages and abilities, this Cornish Area of Outstanding Natural Beauty runs the festival from 28th March – 7th April with many events available for free or a small donation. Events include Exploring Nature, a walk looking at Lutyens’ buildings in Milton Abbot, a Woodland Family Activity Day and Uncovering the Past exhibition continues its tour of the Tamar Valley. 2. Trereife Easter Food & Craft Fair (Easter weekend) – Also in Cornwall, this is a perfect day out for the foodies amongst you. The beautiful grounds of this Queen Anne manor house will play host to cooking demonstrations from gourmet chefs, and marquees with a wide range of producers from Worthy Farm Cheeses and Fish sales from ‘Cornish Smokies’, to locally produced beer, cider and wine. Perfect produce to fill up your picnic basket! 3. Annual Oyster Gathering, Falmouth (Easter weekend) – Go on boat trips to watch the fishermen do their thing at the Flushing Quay on the last weekend of the season. Taste the bounty at the seafood market with some of the catch cooked up by local chefs. 4. York’s CHOCOLATE Story – It wouldn’t be Easter without chocolate! Find out about chocolate’s history, how to make it, and more importantly, taste it, on this tour of York’s most famous chocolate-making families! 5. 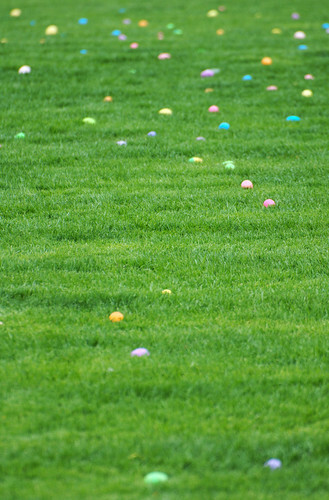 The Great Studfold Easter Egg Hunt, North Yorkshire (30th March – 14th April) – Gather up the brightly coloured eggs from wicker baskets on this Easter egg hunt. Also look out for craft days and the chance to make an Easter card. 6. 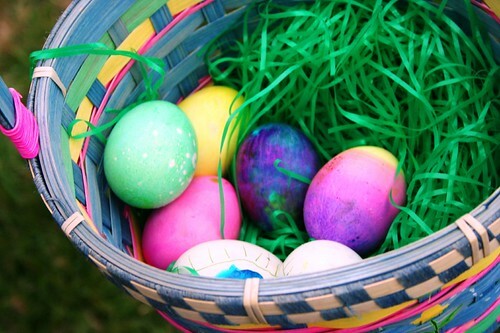 Easter Eggspress at Kirklees Light Railway (Easter Weekend) – A great family day out with bouncy castles, face painting, tram rides, donkey rides, egg hunt and egg and spoon races for both children and adults alike! 7. ‘All About Me’ at Eureka (from 29th March) – A new exhibition to encourage learning through interaction and play at the UK’s National Children’s Museum. 8. Lake Windermere Watersports (29th March – 14th April) – Get active in the water on one of the Lake District‘s most famous lakes. For £10 per person there are family-orientated activity sessions, including canoeing, kayaking, sailing, windsurfing and raft building. 9. The Great Peter Rabbit Easter Egg Hunt, Windermere and Bowness (from 4th April) – It’s the North’s largest egg hunt, with 50 limited edition ceramic eggs to be found across the Lakes. It’s a mammoth task, and one which is probably best spent on a weekend away. 10. Abbot Hall Easter Sculpting Workshops, Kendal (8th – 12th April) – Add to the large willow sculptures, or make a smaller one to take away with you at these workshops over the Easter holidays.